Americans make, on average, 61 trips per household per year to the grocery store. Registered dietitians who work in supermarkets, and who can reach millions of customers, are ideally positioned to make a big impact in educating shoppers on how to buy, prepare, and eat healthier foods. 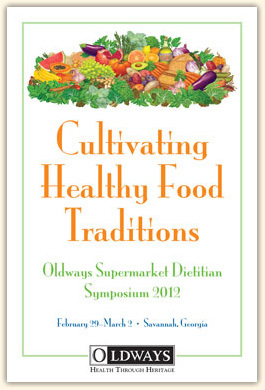 To discuss strategies to accomplish this goal, by-invitation dietitians from supermarkets across North America joined forces with food industry partners committed to improving public health at Oldways’ Second Annual Supermarket Dietitian Symposium, February 29 – March 2 at the Mansion on Forsyth Park in Savannah, Georgia. Barbara Ruhs, MS, RD, LDN, the corporate dietitian for Bashas’ Family of Stores in Arizona, led the vision and helped to create and execute this year’s event. This event featured a cooking demonstration called “Making Your Cooking Demo Sizzle!” by celebrity chef Hugh Acheson, presented by the California Avocado Commission. 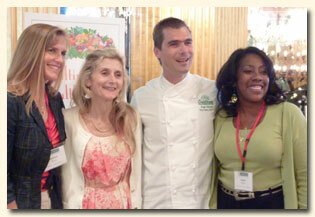 Pictured (left to right): Barbarba Ruhs, MS, RD, LDN, Bashas’ Family of Stores; Sara Baer-Sinnott, President, Oldways; Chef Hugh Acheson; and Angela Fraser, CTSM, Marketing Manager, California Avocado Commision. Watch the video of Chef Acheson’s cooking demo. The symposium included in-depth sessions with more than three dozen speakers, who shared ideas for promoting better nutrition and healthier food choices in supermarkets. To share with you the important messages and takeways from this event, we oﬀer copies of some of the speakers’ presentations below. (Several panels were discussion only, without presentations.) Click on the links to download each presentation. Remember, however, that speakers normally add considerable information orally that is not available in the PDFs; not all presentations will be completely comprehensible without this additional detail. While we oﬀer these presentations for their educational value, we remind you that these works are copyrighted by each speaker and may not be reproduced without the speaker’s written permission. What skills can dietitians master to make them more eﬀective communicators? How can the retailer connect healthy food with pharmacy? Nutrition and Pharmacy: The Dynamic Duo! How can RDs build an eﬀective response to the current public health crisis? Can We Predict Future Trends Concerning Childhood Obesity? Tres Bailey, Director of Federal Government Relations, Walmart Stores, Inc.
How Can Dietitians Responsibly Promote Seafood? • Judy Dodd, MS, RD, LDN, Giant Eagle, Inc.
• Alison Yoder, MA, RD, LD/BS Dietetics, Hy-Vee, Inc.